And you might actually end up wanting to thank him for it. 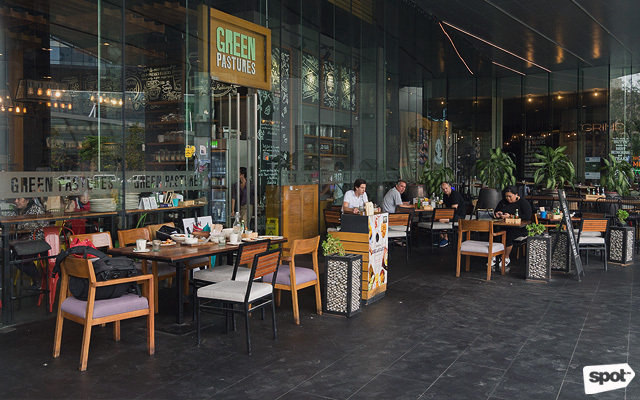 (SPOT.ph) Plastered on the walls of Green Pastures is the core belief of executive chef Robby Goco: “Organic food at its finest.” For the chef, the healthy-eating restaurant was a solution to the problem of people literally getting sick because of the food they eat: “We need to know what we’re eating,” he says. But healthy does not have to be an antonym for fun or delicious. This 2018, Green Pastures adds an awesome slew of Filipino cuisine to its menu. “I’ve cooked cuisines from all over the world, but I realize I have never cooked [dishes that are] Pinoy. It is time to promote our own. The problem with Filipino cuisine though is it can sometimes be unhealthy; it lacks fiber, and sustenance,” Chef Robby says. He has sought to recreate some of our favorite Filipino food in the Green Pastures way, and he has more than successfully accomplished the task, adding his own flair of fun and dedication to healthy organic ingredients. 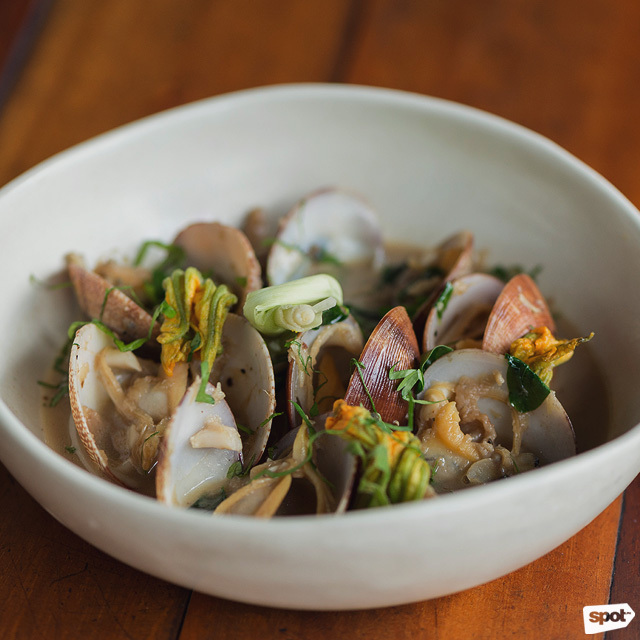 Chef Robby takes on binacol with Steamed Clams (P255), a delicate appetizer of steamed clams swimming in a shallow pool of binacol stock, mingling with oyster mushrooms and squash blossoms. The binacol stock is the triumph of this dish with a subtle heat of ginger, the refreshing hint of lemon grass, and a sweet undertone of coconut water, all balancing on the palate. When we think ukoy, we usually picture the affordable Filipino street food sold in your neighborhood turo-turo but Green Pastures elevates the dish, incorporating sizeable river shrimps and covering them in sweet potato fritters. The result is much like shrimp tempura, but better because of its perfect crispiness. 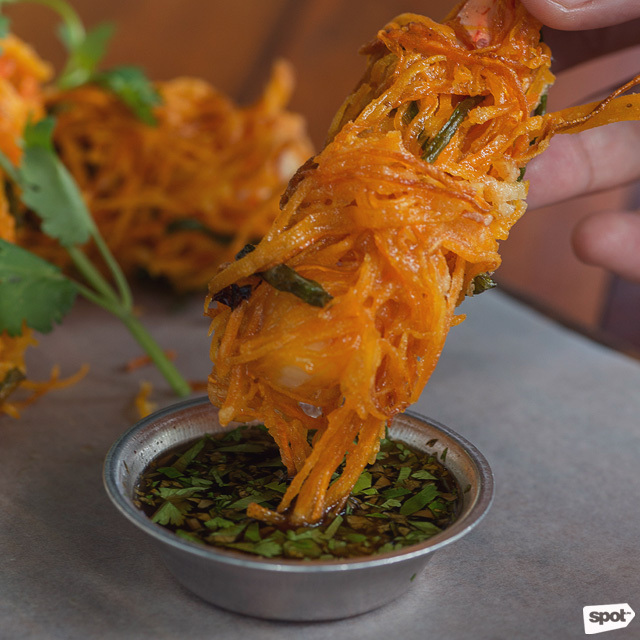 Every bite of Shrimp in Sweet Potato Fritters (P355) is a crunchy adventure that culminates in the plump flesh of that oh-so-delicious shrimp. 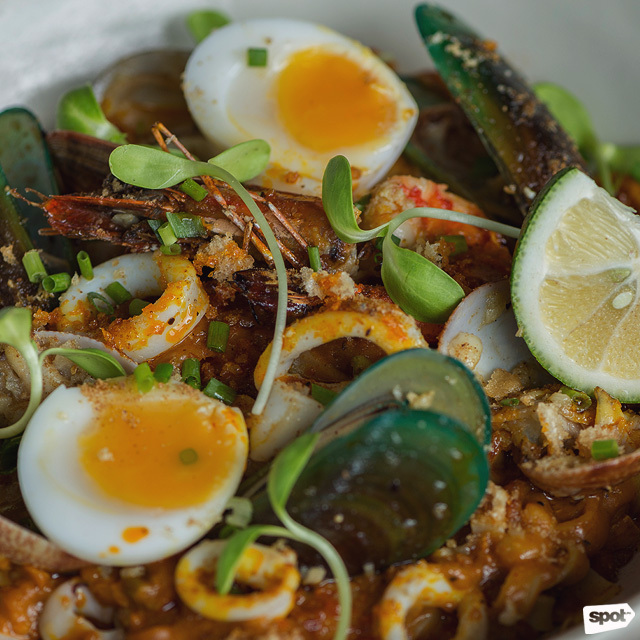 Palabok or Fiesta Noodles (P595) is a Filipino staple, usually enjoyed as merienda, but Green Pastures makes the popular dish their own by heaping clams, mussels, fish, and shrimp into the mix. They top it off with a perfectly cooked duck egg, its gooey yolk combining with the peanut sauce. Tortang talong is Chef Robby’s favorite Filipino food, and when you have it like their Roast Pork Sisig and Eggplant Torta (P310), you might just fall in love with torta, too. 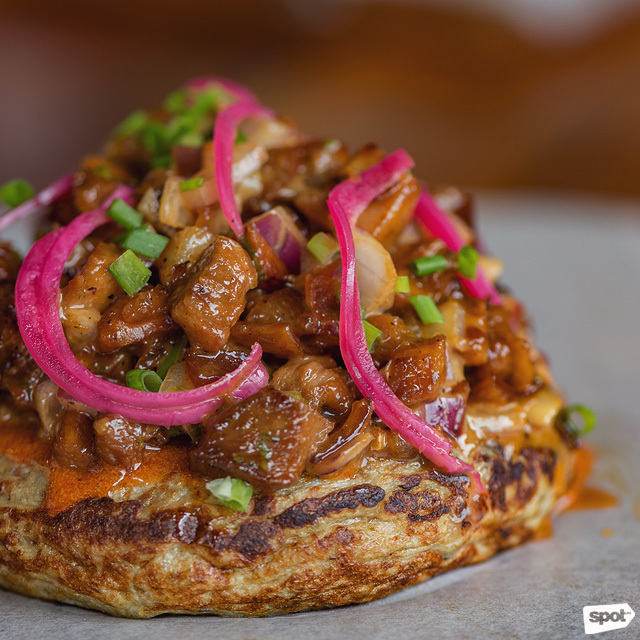 The dish is playfully plated much like a Sloppy Joe, with a circular torta patty as base, topped with succulent lechon sisig, and flavored with their house-made Sriracha mayonnaise. Every bite of this reinvented tortang talong is an explosion of flavors, and before you know it, you’ve cleared the entire plate. No carnivore should pass up Crispy Short Ribs Or Crispy Tadyang (P830). 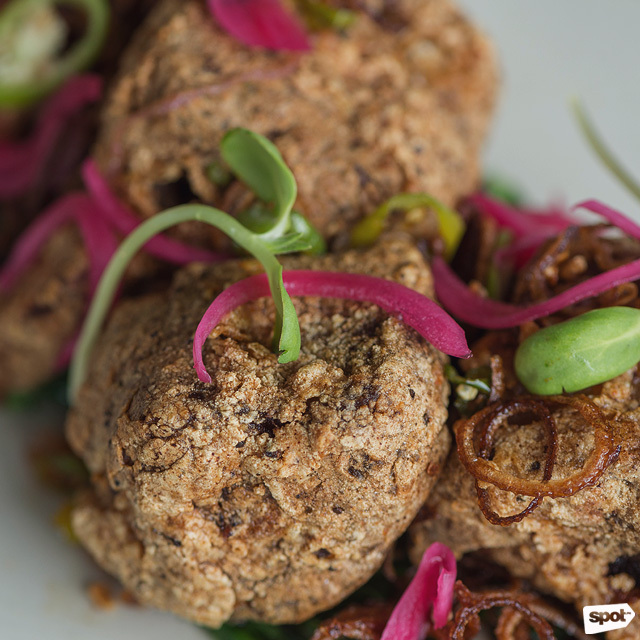 The short ribs are fried with a coating of chick-pea flour which gives it crunch, but you’d be surprised at how tender and luscious the pork is inside. What looks like oxtail, and smells like oxtail, and tastes like oxtail? The Green Pastures answer is jackfruit. 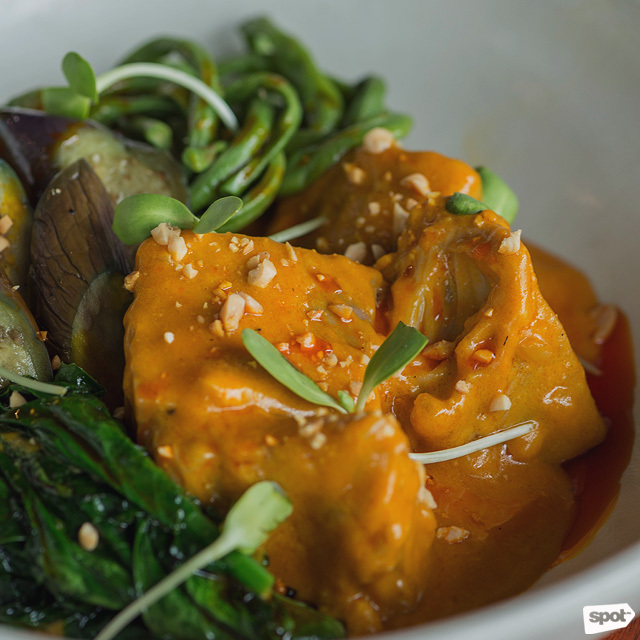 Jackfruit Kare-Kare (P600) is a masterful illusion that could hoodwink the most avid meat lover. It shines brightly with the Kare-Kare peanut sauce, as rich as you'd get with any fatty oxtail out there. Once you slice it, even the inside of the jackfruit looks and tastes like oxtail especially with bagoong! 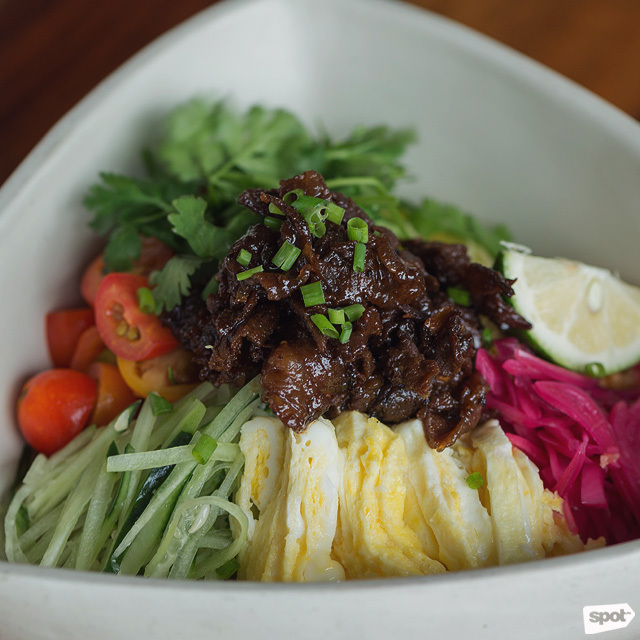 The Bagoong Cauliflower Rice (P690) is a complete meal in itself, served in an enormous bowl that displays its myriad of colorful ingredients: Green mango, pickled onions, cherry tomatoes, lettuce, fluffy eggs, and finally topped with the Green Pasture signature tapa—probably the juiciest tapa in BGC. 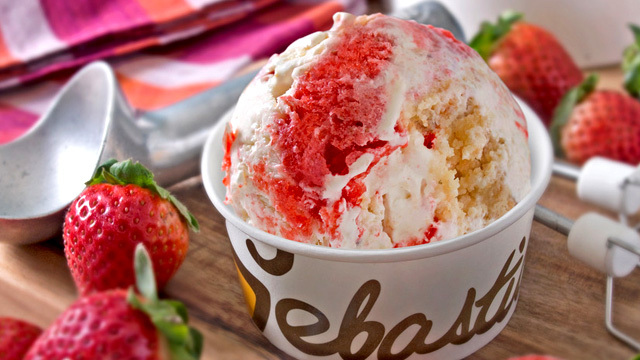 You are then invited to mix all the ingredients together and then dig in to experience the contrasting soft-crunchy, sweet-salty flavors fully. “Nakakaasar ‘yang Bagoong Cauliflower Rice na ‘yan. Kain ka lang nang kain.” Chef Robby remarks, and he does not lie. You keep going at the bowl, and you never seem to get enough. They've replaced white rice with cauliflower rice so it's healthier and lighter, and so you never have to be guilty when you order another bowl. 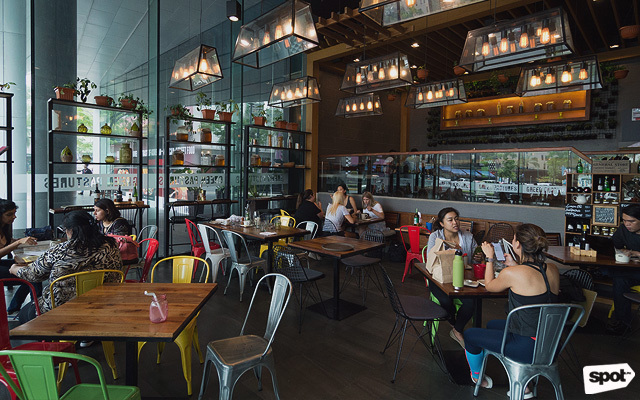 In fact, you could say the same for the rest of Green Pastures’ new Filipino dishes. 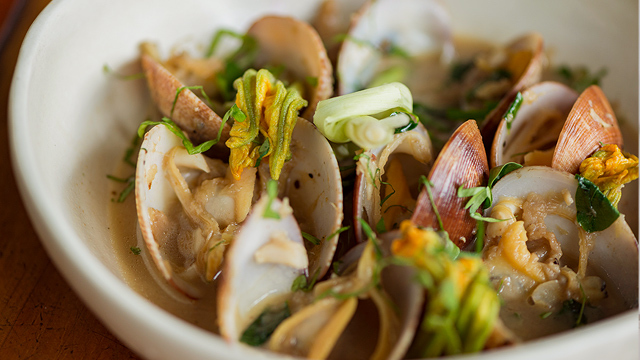 Chef Robby substitutes certain ingredients with lighter alternatives without taking away from what makes these Filipino dishes such a classic. With dishes that are fresh, organic, yet incredibly tasty, you’ll dig in, guilt-free. 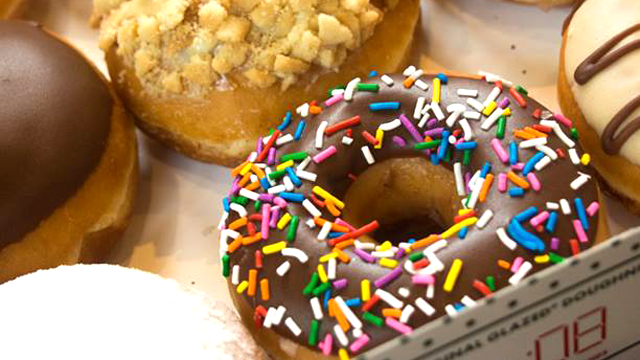 Your body might even thank you.